This has been a weekend for blockbuster reporting. First came The New York Times‘ jaw-dropping revelations concerning an FBI probe into whether or not real estate mogul Donald Trump was working on Russia’s (read: Vladimir Putin’s) behalf following the firing of then-FBI Director James Comey. There is no precedent for a commander-in-chief HIDING vital information from Secretaries of State and Defense, not to mention intelligence agencies. You might think Trump has several things to hide. You could come to believe that he has adopted a policy one would expect from autocrats. 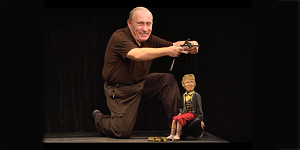 Heck, in light of the Friday night revelation in the NY Times, you might even conclude that Donald J. Trump is acting against the interests of our nation — and that Donald J. Trump is Vladimir Putin’s puppet. It is long past time for Trump to be removed from office. But we can forget about possible invocation of the 25th Amendment based solely on the number of “acting” cabinet mambers and Rapture-cult nutter Secretary of State Mike Pompeo’s servile loyalty to the failed vodka and steak magnate installed in the Oval Office. Moreover, don’t count on members of the unpatriotic Republican Party on Capitol Hill to raise a finger.